McALLEN — A former chief of a western Hidalgo County city’s police department remains in custody after pleading not guilty to federal drug charges. Despite Magistrate Judge Dorina Ramos granting Geovani Hernandez a bond nearly a month ago, he remained in custody as of Tuesday afternoon and into the foreseeable future. Hernandez, 43, of Weslaco, who entered not guilty pleas Tuesday to two counts of conspiracy to distribute a controlled substance, was granted a $100,000 bond on Aug. 18, but remains in custody due to lack of a co-surety signature, according to court records. The former La Joya police chief was arrested Aug. 12 in connection with a federal investigation that revealed he had been working with a go-between contact for an unidentified drug trafficking organization. 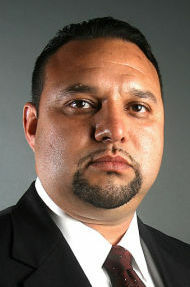 Hernandez, who resigned from the La Joya police department in January 2015 to pursue business interests, faces three federal charges: attempting to possess with intent to distribute a controlled substance, possession with intent to distribute more than five kilos of cocaine, and aiding and abetting, according to court records unsealed Monday. He was most recently working as a “provisionary sergeant,” with the Progreso Police before his arrest. During the meeting Hernandez allegedly told the informant that he needed money for his Hidalgo County constable campaign. He also told the informant that he was a close friend of Gulf Cartel Plaza boss Juan Manuel Loza-Salinas, aka “El Toro,” who ran a plaza in Reynosa, Mexico, the complaint states. Hernandez met with the informant days later where he handed the person a document that contained detailed information regarding the vehicle license plate. In late June, Hernandez met again with the informant; this time the government informant handed Hernandez a note with a person’s name and date of birth and asked him to run a background check on the person to see if they were working as an informant. Based on the complaint, Hernandez was paid approximately $8,000 between May and July 2017. District Judge Randy Crane will preside over Hernandez’s trial, which is set to begin in early November, according to court records.